Opened some time around that of Pleasure Island's debut, much like the character the store was based on, the store had some interesting features. The most dramatic and recognizable was the huge two-sided 30' neon sign of Jessica herself sitting atop the outside of the building. Not just a static sign, Jessica's leg actually swung back and fourth slowly. Her dress was accented with sequins that moved in the breeze and attracted the light. A purple neon outlined her silhouette. An entire corner area of the building used glass window panels from top to bottom. It had an extreme vaulted ceiling and its design seemed to mimic that of a big city skyscraper. The rest was a soft-purple colored metal which went along with the warehouse look of the island buildings. Located on Breeze Way, the outside of the store was just the beginning. The dramatic glass corner allowed natural light inside, yet there were also lighted pillars which resembled those in the Ink and Paint Club. There was an art deco style to the counters and displays, which were mostly a dark and light grey combination with a shock of neon blue. The Jessica shower curtain hung facing out one smaller windowed area. A large circular mirror with Jessica's signature and kiss was nearby. In one corner of the store there was a dressing room door prop which included a star and Jessica's name on it. Another area had a large wood cut-out of Roger, Jessica and Benny the Cab. 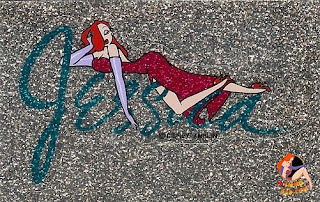 Above the cash register, located at the center of the store, was a dimensional cut-out of Jessica, laying across a sign of her name. Some of the merchandise items available were T-shirts, suspenders, ties, shorts, jewelry, pins, bath towels, mugs and hats. There were also some signature store items created like key chains, watches and a Jessica Fashions line of clothing. On November 16th 1991, my family had the good fortune to take a trip to Disney World. After many difficult years that had just passed for us, it was a long needed and well deserved vacation. I had a friend go to MGM Studios and bring back enough photos to make me jealous, so I was finally getting my chance to "meet" Jessica at the park - even if it was only a cardboard standee, it was more than I needed. 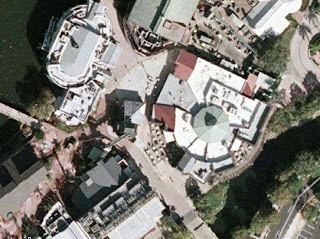 Little did I know what else Disney had tucked away in the middle of Pleasure Island. It was almost by accident that my mother found the listing for Jessica's in the Pleasure Island guide map where it invited people to visit the “torch singer’s” own boutique. We were staying at the Buena Vista Palace, which was a short walking distance from the Disney Marketplace. I couldn't wait, so we immediately took a walk over the night we arrived, only to be told there was a fee to get into Pleasure Island during the evening and could not even enter if you were under 18. I could clearly see the back of the neon Jessica sign lit up and at that point, was not sure if I would get in. There was music playing and lights, it was all very exciting. We were informed though that we could come back in the morning and go to any of the stores when Pleasure Island was open to the public. 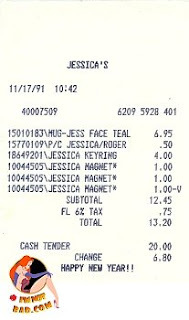 I've kept my Jessica's store receipt all these years and as you can see, I was up quite early the next morning. We arrived through the back entrance and there was a small red box next to the door with a neon blue "Jessica's" signature, dotted with a kiss. I described the building, but going in was such an experience. This was my favorite cartoon character and I was just lucky enough to enjoy a store dedicated solely to her - that up until a few hours ago didn't even know existed! It was a bit overwhelming. At the time, I was almost too young to fully enjoy it. I didn't have a need for ties, oven mitts or robes, but now I regret not spending so much more money there. Cast members wore regular blue uniforms and there were no special shopping bags or print material. The store did seem a bit more aimed at women, with all of the Jessica nightgowns, jewelry and pink shirts around. Still, there was a lot of great merchandise, even a life-size Roger plush by the entrance. I believe we were the only ones in the store at the time but it was also still off season. I remember the cashier girl being very friendly and saying she thought the Jessica key chains were so cute. I ended up only buying a blue mug with Jessica's face and signature on it, a postcard of her and Roger, a very rare key chain with her head and signature and an equally rare magnet - which I was charged twice for but the cashier did void it. As gifts though my mother did buy me a highly sought original Jessica beach towel and a Jessica jewelry box and my Aunt recently gave back to me a cup we bought her with Jessica and Roger filled with hearts and glitter. Over the years I have acquired other items from the store to piece together a nice collection. I don't know why, but I did not take any photos of the interior. I took it for granted the store would always be there. Tomart's Disneyana Magazine # 66 did a full feature article called Remembering The Jessica Shop which included several interior photos, none of which have been seen since the store was open. Having not seen Jessica's since 1991, it was a nice little tribute to this fun store and it was great to see it again after all this time. You'll want to be sure and get a copy of this magazine while you can. A few things I regret not picking up were some shirts that had the Jessica's tag on them, ties, shorts and the Jessica watch which featured a swinging leg like the store sign - although it was a woman's watch. Speaking of the store sign, it was truly a sight - and when it was part of the store - you were in very close contact to it. I have often seen the store mistakenly referred to on-line as "Jessica's of Hollywood" or "Jessica's Secret" and until now there was never much information about it. On this blog, you will find a great interview I did with talented Jessica cartoonist, Mark Marderosian and get a better idea about this store. Jessica's was abruptly closed in 1992. The building went on to become the Music Legends store, a tattoo parlor and in 2007 a smokers lounge called Fuego by Sosa Cigars . The large neon Jessica sign was eventually relocated to another area of the park atop the West End Stage along side a “Pleasure Island Tonight” sign, where it remained a popular visual for many years until the sign and entire stage were removed in June of 2006. The following article first appeared on my original Jessica Rabbit Yahoo Group. It then appeared for a time on Wikipedia. The Jessica Rabbit and Roger Rabbit section of Wikipedia has severely changed and my article is heavily altered. The article was then part of my Jessica Rabbit Video Toonography. It's come to my attention that other sites have copied the origial article, are using my photos and videos. I do not have a problem with that, however one site tried to download something on my computer when I clicked the photo (I've since looked for the the page again but cannot find it, so perhaps it has been taken down). 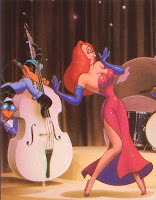 For a long time now, there have not been any websites for Jessica Rabbit fans excepts the ones I have created - p-p-p-please be careful of the pages you visit and bookmark this site to keep visiting the only Jessica Rabbit Fan Site, News Board and Archive on the web. Kent Melton (Classics Collection Statues "Dear Jessica, how do I love thee", "I’m not bad, I’m just drawn that way".) 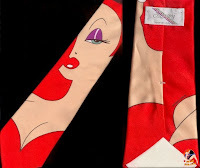 The Walt Disney Classics Collection piece "I’m not bad, I’m just drawn that way" was first in the Leading Ladies Series.